First, in a large bowl, combine your marshmallows and butter and heat in the microwave for 1-2 minutes and mix. Mix in a few drops of orange food coloring. Be conservative. Add as needeed. Next, mix in your Rice Krispies cereal until your cereal is evenly covered in your marshmallow mixture. Grab your 9×13″ baking pan and grease it. Press your Rice Krispies mixture into your pan firmly. 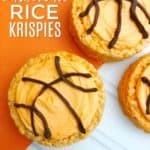 Let Rice Krispies set for a few hours or in the freezer for 15 minutes and use a circle cookie cutter to cut out basketball shaped Rice Krispies. Finally, fill a decorating bag with the melted chocolate and use to draw the lines on each basketball Rice Krispie Treat.